Approx. 4.165.000.000 Liters* ATF requiring change. How big is your share? 49% of the vehicles** worldwide have an automatic transmission. That means there is a big opportunity to make business with the change of ATF-Fluids. The car manufacturer advice the car owner of cars with Automatic Transmission to change the fluid after 50.000 km. Within our all in one solution we can offer you our outstanding ATF Machine with a complete adapter kit for all car manufactures. But that´s not all. 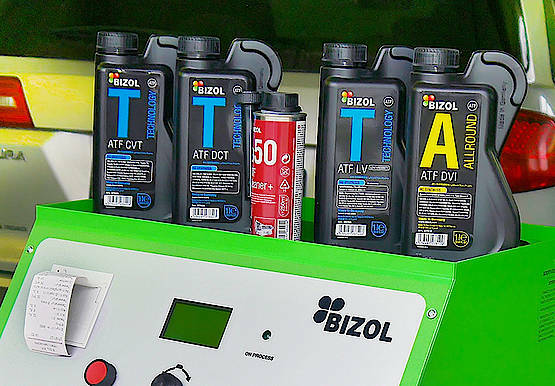 In addition we also provide you with our high performance ATF-Fluids and our BIZOL ATF Cleaner+ a50 for extending the transmission service life. 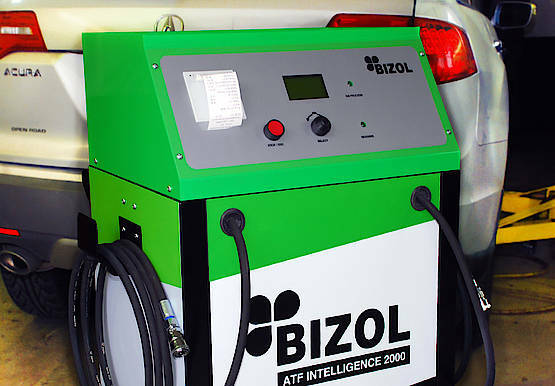 The machine features an exclusive electronic control system that lets you replace ATF fluid without having to open the completely empty gearbox, regardless of the difference in temperature between the fresh fluid and the used fluid. In addition to controlling the operation of the pump of the ATF, the machine’s software monitors the fluid replacement operation.